Photographic retailer Jessops plans to close 81 High Street stores, about a quarter in total, and cut 550 jobs. It said that 47 of the stores overlap with other Jessops shops in the same area, and three will be relocated, leaving the retailer with 234 stores. It is part of a strategic review which aims to save the Leicester firm £15m. The company has been suffering from strong internet and supermarket competition in the digital camera and equipment markets. 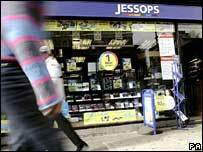 Jessops' shares gained 7% to 19.25 pence in London on the news. In March shares plunged almost 70% after the photographic retailer issued its second profits warning in a month. Commenting on latest moves, executive chairman David Adams, said: "The strategy allows us to re-position Jessops as a true multi-channel retailer, building on our core strengths in the digital imaging market place." He continued: "The board is confident that Jessops will deliver a significant turnaround in its financial performance." The company said that its pre-tax loss was £8.5m in the 26 weeks to 1 April, compared with a profit of £5.1m a year earlier. Like-for-like sales fell 12.9% in the 12 weeks to 17 June, while total sales dipped 9.8%. Jessops, which also annouced that it had extended a loan agreement, expects its full-year pretax loss, before refinancing and restructuring, to be close to £6.5m.